Download a free backyard landscape design. All our information and guidance makes the adaptation of the garden design a breeze. Tips for landscaping your garden plan are all over our site. We really made it easy for you. Visit our garden plans plans page for an overview of the complete range of downloadable garden designs, or learn how to do your own garden design. This garden was designed for a hot climate. It made extensive use of the plants growing in the area. To adapt the front yard landscape design to your area you should replace some of the plants on the plant list. That is the fun of doing it yourself. You can include your favorite plants. Oh yes, one last thing before we get to the backyard landscape design. 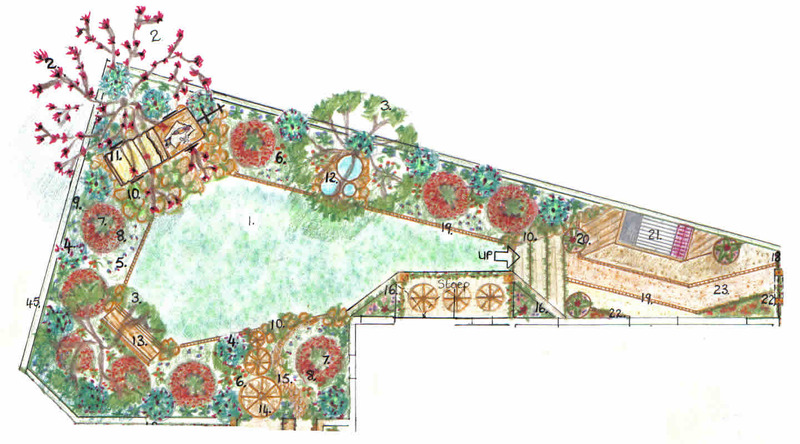 All the gardens on our website, including this garden design, may be copied free for your use, in your home garden. You may not use any of our designs or parts thereof, for any commercial purposes. I’m sure you understand! The house is situated in an exquisite mountainous area. This home blends in well with the surrounding environment. The ground is slightly sloping (good for drainage). Services on the site include municipal services, irrigation system, sewage pipes and sanitation. Electricity had to be laid on for the garden lighting. The shape of the back garden links with the architecture of the house. It contains three focal points, a bench, a water feature and a wagon. The custom made wagon is positioned on a rocky outcrop. The outcrop is planted up with Protasparagus densiflorus. A common coral tree planted behind the wagon provides a canopy. This purposefully gives the impression of the rising sun at daybreak. An ornamental bag of corn, I rooster, 1 hen and three chicks are placed on the back of the wagon. This adds humor and shows attention to detail in the design. It also introduces the pioneer theme. The main focal point is lit up at night with gentle soft lights. Two Celtis sinensis trees frame the wagon. Similar plants are planted around the garden to create unity, balance and rhythm. A barbeque area provides entertainment opportunities. This backyard landscape design forms part of a larger garden design. The complete design includes a backyard garden design plan, a front yard design plan and a courtyard design plan. Download the backyard landscape design and plant list. You may also download the complete garden landscape . Note the picture file size is 173 kB and may require some time to download. Right click on the link and "select save as.." and save to your PC. Select a suitable image viewer to view the picture. Return from Backyard Landscape Design to Garden Plans.